There are diss tracks and then there is ‘Kapinye’, released by rapper DNA in response to the veteran DJ Pinye. DJ Pinye, in an interview with NRG radio last week, stirred up controversy when he confessed that he cannot play music by ‘Lamba Lolo’ group Ethic. 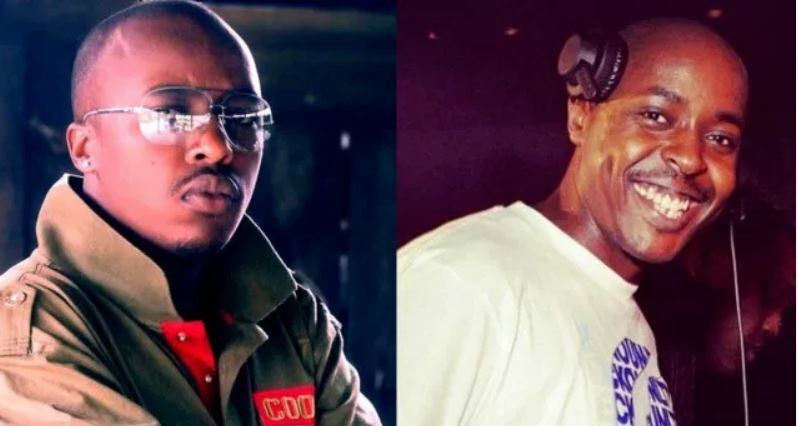 At the same time, Pinye claimed he never played songs by DNA and Khaligraph Jones at the start of their respective music careers because the two made mediocre music. “There are artists whose music I did not play back in the days including Khaligraph and DNA but their career has grown. I cannot play Lamba Lolo or New Position. DJs shouldn’t play mediocre music,” said Pinye. 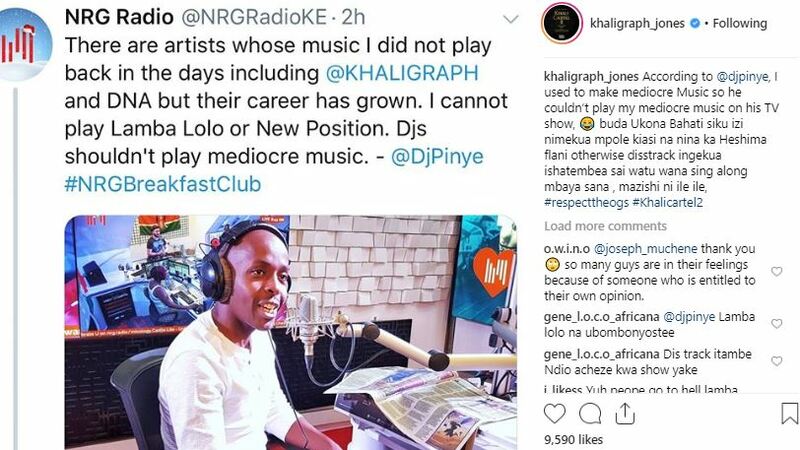 While Khaligraph Jones chose the high road and let DJ Pinye off on a warning, DNA had other ideas as he hit the studio to cook up some heat. DNA even sent a warning shot on social media first, leaving netizens in anticipation for the diss track of the century. 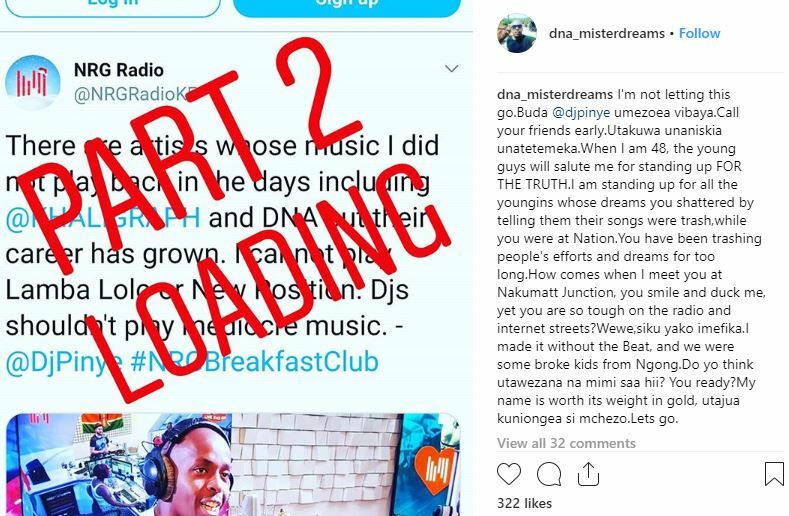 However, when the track finally dropped, evens fans of DNA who were rooting for him to put Pinye in his place were disappointed as it emerged that the ‘Banjuka’ hitmaker had shot himself in the foot. According to Netizens, the diss track titled ‘Kapinye’ is exactly the mediocre music DJ Pinye had been complaining about. Check out some reactions and the diss track thereafter. Totally Crap. Dj Pinye was right not to play your music. But tukiongea ukweli, DNA pia huwa na ngoma za ujinga. That is the truth. But Pinye should not be so full of himself as well.